At Al Arabi Travel Agency, we’re always on the lookout for great new suppliers to work with. We recently became a partner of Platinum Heritage and we’re incredibly excited to be selling their products. 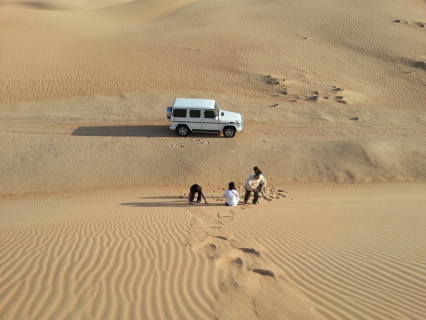 One of the most common consumer complaints about desert safaris is that they’re just not authentic enough. This is where Platinum Heritage strives to be different and they very kindly invited us along on Friday 15th February to see their set-up (for reference, we attended an adjusted ‘Heritage Dinner Safari’, though we also got to see aspects of the Platinum setup). 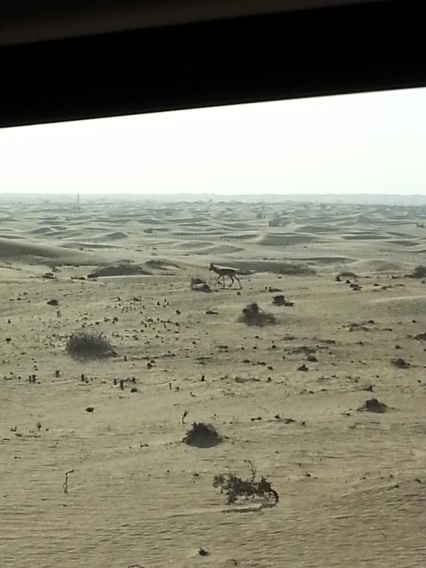 We set out from Dubai around 3:30pm and arrived in the Dubai Desert Conservation Reserve (near Al Maha) a little while later. 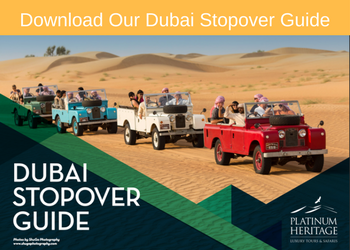 The first thing that struck us was that the company doesn’t use Land Cruisers like most desert safari companies, rather, they use a Mercedes G-Wagon or vintage Land Rovers depending on which package you choose. We experienced both of these vehicles – the G-Wagon was the epitomisation of luxury but the Land Rovers were great fun as well. 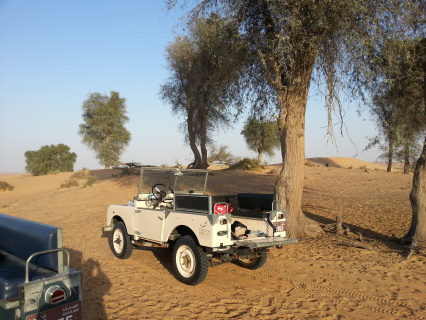 Open top, old school – just a brilliant way to see the Reserve. 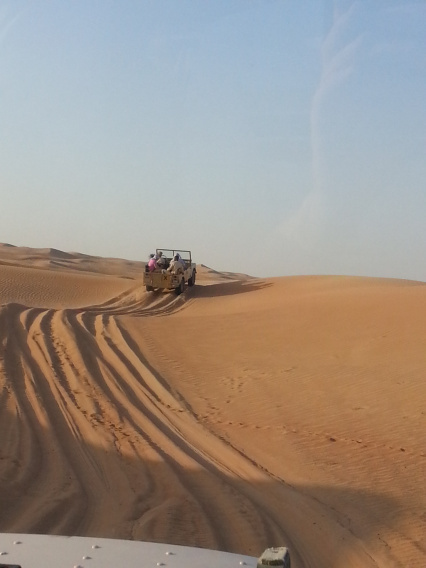 Dune bashing does NOT feature with Platinum Heritage. They take a very careful attitude towards sustainability and conservation so as a result the cars do not charge around the desert. The reserve is home to around 400 Arabian Oryx and countless gazelle as well as desert foxes and hares, so the company steers clear of dune bashing in order to maintain the beauty of the environment as well as the safety of the local fauna. 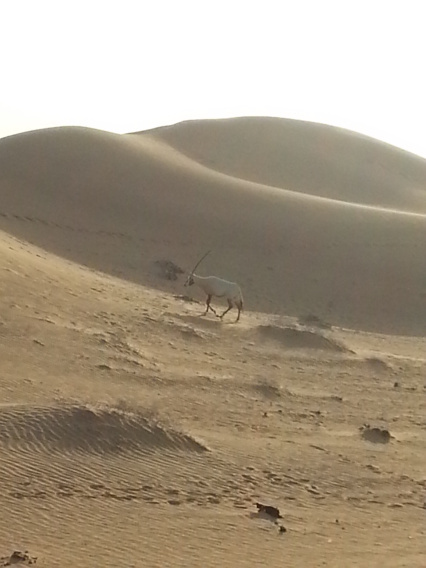 Somewhat surprisingly, I’ve lived in the UAE for 13 years and have never seen an Arabian Oryx so it was a joy to be able to see these animals in their natural habitat. They were quite used to seeing cars so it gave us a great opportunity for the animal to be calm and for us to observe them in their environment. Our desert guide was incredibly knowledgeable. 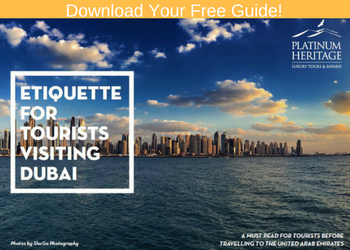 Platinum Heritage staff are trained to be knowledgeable, insightful and the respect they have for the desert really shines through. Our guide could name every plant, could spot every track and his keen eye ensured that he’d always point out the animals. One of the nicest moments came after we had seen the oryx – we managed to spot a herd of around 40 gazelles that were running full pelt across the dunes. They were incredibly fast and I, sadly, wasn’t able to get a picture of the entire herd. 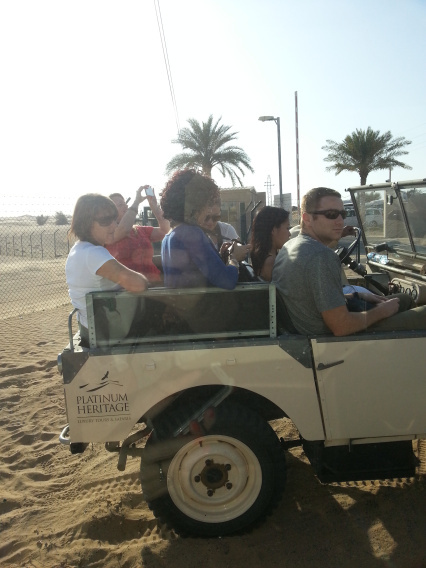 After we had our turn in the Mercedes it was time to go in the vintage Land Rovers. I LOVED the G-Wagon but there was something absolutely brilliant about the Land Rovers. It’s probably a bit of nostalgia as my first car was an early model Jeep Wrangler and the Land Rovers reminded me of that car quite a lot (note to self: buy another old Wrangler in the future). Next, we were taken to see a falconry display. 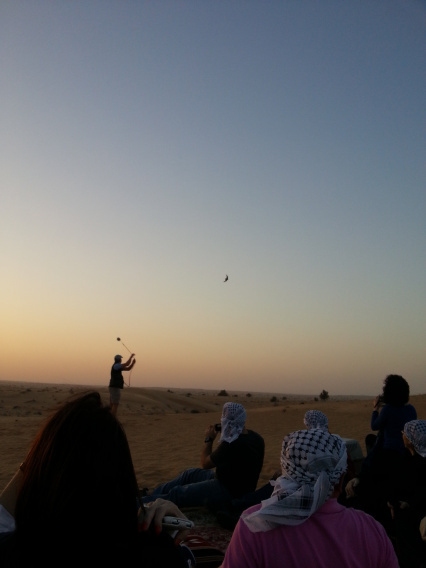 Most of Platinum Heritage’s falconry team hail from South Africa and are incredibly well-versed in the falcons. It’s easy to see that the guys have a true passion for falconry and are very dedicated to keeping the art form alive. The falconry team also had a 5 week old desert eagle owl with them as well – possibly the sweetest thing I’ve ever seen. It was just at the point where it was learning to fly but could only glide about 4-5m at a time; they told us that he’d probably be flying within a week or two. The peregrine falcon (named Summer) was stunning. Until you see it in real life, you just can’t believe how fast these birds are. They have a top speed of around 300 km/h and you really need to watch carefully as they attempt to hunt the bait. It was particularly interesting how Summer used the group of people to aid in the hunting – she’d fly high in the air before diving back down behind the assembled group and then would pop up from behind the people in order to surprise the bait. It was a great experience and the falconry team made the whole thing incredibly interesting. At this point we went back to camp where we were greeted with beautiful Arabic coffee as well as wash cloths – the Land Rovers, being open top, could be a little dusty so if you’re sensitive to dust I’d recommend taking something to cover your nose and mouth during the drive as well as wearing sunglasses. The camp is COMPLETELY different to those offered by cheaper operators. The cheap operators usually have enormous shared camps with hundreds of people but Platinum Heritage offers a much more intimate experience (the camp has a maximum of around 40 people). It’s calm, tranquil and peaceful – you really feel as if you’ve gotten away from the city. After our welcome, we were shown the traditional ways to make coffee and henna was available for those who wanted it. 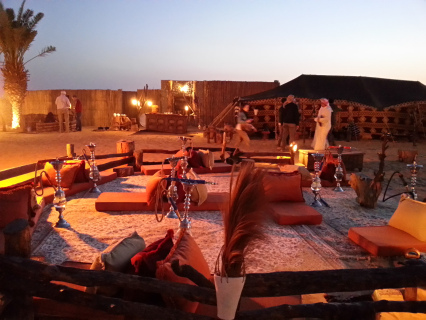 A shisha area was freely available as well. Our second starter consisted of traditional arabic mezze such as kibbeh, hommous, fattoush, sambousek and tabbouleh. However, the main event came after this – we were treated to ouzi, an incredibly flavoursome lamb dish. The lamb is baked in the ground for 6hrs, and served with lamb rice or a vegetable rice. There was also chickentikka skewers and shish tawook. A full vegetarian option is available but as well but you will need to inform Platinum Heritage (or ourselves) in advance. The food was genuinely superb – much, much better than the cheaper safari operators can offer and we were able to enjoy it totally at our own pace without being rushed through a buffet station. After dinner, most of us moved to the shisha lounge for shisha and dessert. Dessert consisted of fresh fruits and luqaimat, which was a great option after a filling dinner. We were entertained by a traditional Emirati dancer (not a belly dancer). After we had relaxed, we went to view an aspect of the Platinum experience before we left the camp. The Platinum heritage is, essentially, the ultimate VIP experience. The camp is completely private (a maximum of 12 people) – imagine a dining table and majlis, just for you, in the middle of the desert, and you’re pretty close to imagining how it looks. I did try to take pictures but it was very dimly lit (want to make an amazing proposal? This is definitely the spot, so romantic) so my phone didn’t really take very good photos. 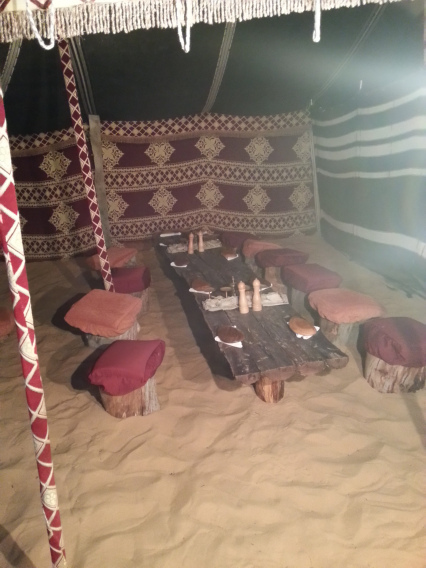 As well as the ultimate in desert privacy, you also get a 6-course dinner which you decide before the trip. The Platinum side of the business is essentially all about you; personalisation and privacy. So that pretty much sums up our Platinum Heritage experience and it’s highly recommended. In terms of pricing it doesn’t actually work out a huge amount more than cheaper operators. The Heritage Dinner Safari that we went on costs AED495 for adults, AED395 for children (call us for bookings) and is well worth the money. Platinum Heritage has a huge range of packages so please get in contact for a full breakdown.